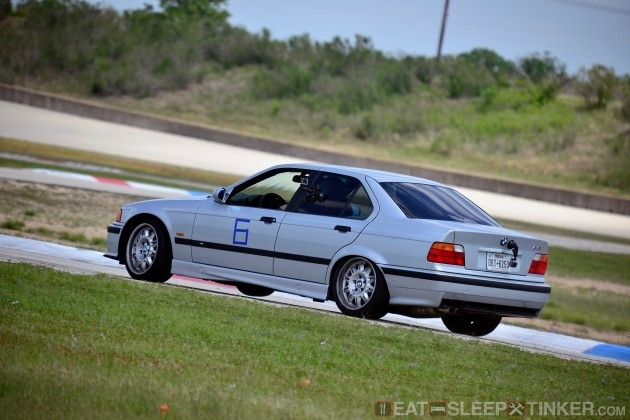 After all the work completed on the M3 Sedan, I might as well get it out on the track to see how well it all held together. Of course it was also my only remaining “track car” with the MR2 still in the shop and the M Coupe sent off to South Carolina. So far I’ve rebuilt the rear suspension, adding the Turner Motorsports rear camber arms in an attempt to squeeze in a set of 17×9 Team Dynamics with some NT01 255/40/17 rubber. Unfortunately, even with a slight roll, it would require way too much negative rear camber to fit. 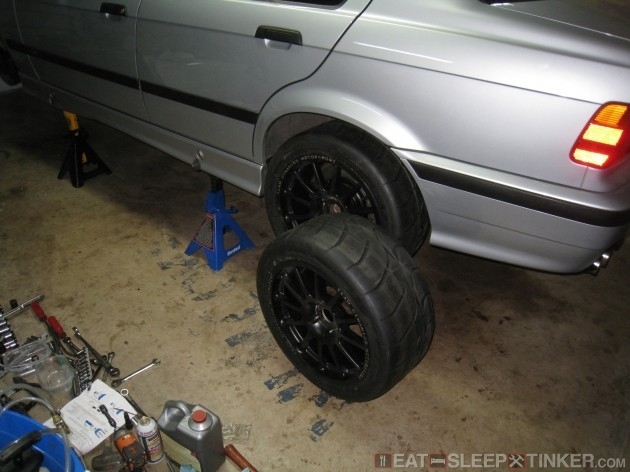 Additionally, the fronts would rub on the coilovers, even with a 12mm spacer. 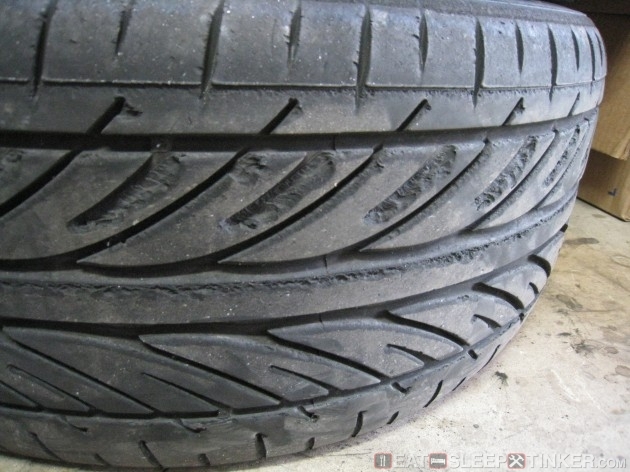 So I scrubbed the idea of trying to fit some “track day” rubber and would just run with the stock stagger and the Hankook V12′s that came on the car. 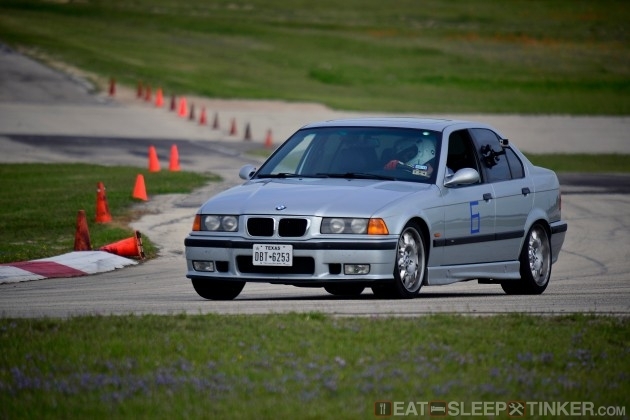 This track day was organized by Chin Motorports, their first at TWS and first in Texas. I hadpreviously run with them at NOLA, as they began their expansion westward. I had a credit with Chin, since they had lowered their price for that event, which was just enough to cover a single day at TWS. It was still a small turn-out, being that Chin is still growing here in Texas, but that just meant plenty of room. I was even able to get a garage space with a fellow track day buddy. Since TWS is just under two hours away, I drove in that morning from the house. Fortunately the weather was cooperating, no flooded in-field this time. I was in a bit of a rush getting the car back together from all the rear subframe work and was unable to get a proper alignment completed. I adjusted the rear camber using the Turner instructions and a digital slide caliper to measure the arms and match them side to side. These settings are based on a stock ride height, which my car is certainly lower than. The result was a lot of rear negative camber, A LOT. Unfortunately time had run out, so off I went, with my rear looking like I was auditioning for a “stance” (or is it “stanz”) calender shoot. All in all, the car handled well given the shortcomings. It still plowed like you’d expect, and the tires weren’t really up to this type of driving. So much so that the tread began chucking horribly on the outside (right side for this configuration.) I also noticed quite a bit of valvetrain tick, a result of the hydraulic lifters and a poor oil pick-up design. The common solution, albeit a poor one, is to add extra oil. This only slightly lessened the noise. As for the car, it’s a bit of a let down coming from the M Coupe. The S52 is no comparison to the S54. Not only is it down about 90hp but it’s also limited to a 6,700rpm redline, compared to the S54′s 8,000. I found myself hitting the limit constantly, I’ve probably built up a bit of memory on shift points based on the M Coupe. I didn’t have the grip or balance to make it into a true momentum car, so I was at a bit of a disadvantage. That said, the handling was still very predictable and easy to drive, albeit a bit soft. The previous owner who installed the TCKline suspension had spec’d incredibly soft spring rates with a stiff H&R front anti-sway bar. The results: Tripod Action! Below you can see a video of a few laps, still hung with (and passed) a few Vettes.